Beef brains and veal (juvenile beef) or calf's brains are used in the cuisines of France; Italy; Spain; El Salvador; Mexico, etc. 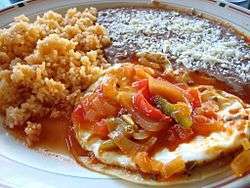 where they are called sesos in Spanish and are eaten in tacos and quesadillas; Pakistan, where they are known in Urdu as Maghaz; Portugal; Indonesia; and in the United States, especially in St. Louis, Missouri, and the Ohio River valley. Calf's brains, or cervelle de veau, is a traditional delicacy in Europe and Morocco. It is the brain of a calf consumed as meat. It is often served with tongue, sauteed with beurre noir and capers, or mixed with scrambled eggs (a traditional breakfast dish in the United States). In Italy cervella fritte is a popular dish made of bite-sized batter-fried morsels of beef brain. Beef brains have a mushy texture and very little inherent flavor and are typically flavored with sauces such as chile sauce and Sauce ravigote. 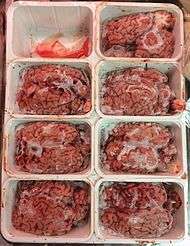 The consumption of beef brains and spines is restricted in many locales because humans may contract Bovine spongiform encephalopathy (commonly known as mad-cow disease), by eating the nervous tissue of diseased animals. Still, there have been few such cases in areas where bovine spine and brains are eaten. ↑ Ward, Artemas (1911). The Grocer's Encyclopedia. New York. ↑ Payne, A. G. (2006). Cassell's Shilling Cookery. Read Books. p. 178. ↑ Farmer, Fannie Merritt (1916). Chafing Dish Possibilities. Little, Brown, and Company. p. 107.